Acupuncture uses needles to induce changes in soft tissues. Acupuncture is believed to activate the built-in survival mechanisms that normalize the body and promote self-healing. Acupuncture points coincide with tissues that can elicit strong responses. These responses stimulate the nerves in the brain that connect to hormone production, blood pressure control, control of emotions and the relaxation of tendons and muscles. Acupuncture reduces pain by causing endorphin release. Acupuncture stimulates nerve fibers that block other nerves in the spinal cord. This is called the gate control theory of pain. Stimulation of nerve fibers also causes the release of cytokines and other chemicals responsible for inflammation. Needle stimulation of the connective tissue causes the release of other chemicals called neuropeptides. These neuropeptides include calcitonin gene-related peptide (functions in the transmission of pain), nerve growth factor (critical for survival of sympathetic and sensory nerves), substance P (neurotransmitter), and vasoactive intestinal peptide (lowers blood pressure). These substances repair nerves, control blood pressure and improve nerve function. In recent years, research has been prompted by the introduction of advanced brain imaging techniques such as functional MRI and PET scans, both of which have further elucidated the relation between acupuncture stimulation and activation of neural structures. Deactivation of the limbic system (responsible for emotional memory) by acupuncture stimulation has been noted by these studies. There are two nervous systems in the body; the parasympathetic and the sympathetic which correspond to the Yin and Yang of Chinese thought. One of the nervous systems is controlled by conscious thought (sympathetic – muscle movement etc.) and the other controls the body activities unconsciously (parasympathetic – heart, digestion, breathing etc. – automatic activities). Chinese thought puts acupuncture as a mechanism for balancing Yin with Yang. Modern medical findings support this by documenting chemicals that are released from the brain during acupuncture causing reduction in pain (opioid release), brain excitation learning and memory (glutamate release), memory of pain (NMDA receptor activation), mood and social behavior (serotonin release) and intestinal function and digestion (cholecystokinin release). 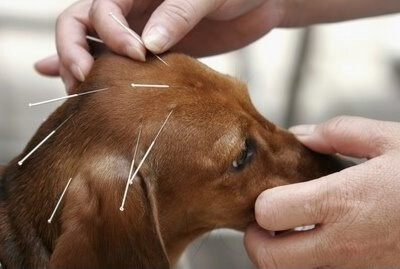 Acupuncture in the Intervertebral Disc Disease (IVDD) patient is not curative but is initiated to relieve pain, reduce muscle spasms and stress, and may modulate the immune response. Electrical stimulation of acupuncture points (electroacupuncture) is used most commonly today because it is less painful than manual stimulation, provides better analgesia, and facilitates standardization of therapy. Acupuncture may facilitate early mobility by reducing pain, inflammation, and stress. Early mobility may prevent muscle atrophy and reduce the degenerative effects on the intervertebral disc.